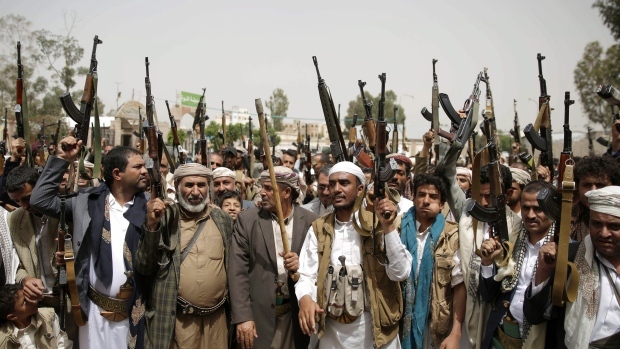 SANAA, Yemen -- At least 69 people have been killed and dozens injured in two days of fighting in central Yemen between rebels and forces loyal to the internationally recognized government, Yemeni security officials said on Sunday. The officials said government-allied forces have taken control of several areas previously controlled by the rebels, known as the Houthis, between the central provinces of Marib and Shabwa. The officials spoke on condition of anonymity because they weren't authorized to brief journalists. It was unclear how many of the remaining casualties were Houthi fighters and how many were civilians. Tanks and armoured vehicles were burnt, and the bodies of some of those killed were left uncollected due to the heavy fighting, eyewitnesses said. A truce between the warring parties that began April 10 has largely held despite violations by both sides. The conflict in Yemen pits Shiite Houthi rebels and supporters of a former president against Yemen's internationally recognized government, supported by a Saudi-led, U.S.-backed coalition.